This article is an extract taken from the book The Path of the Spiritual Sun. Some of the most famous ancient megalithic sites in the world align to the summer solstice – in numerous different cultures: Paleolithic (second period of the Stone Age which lasted until the end of the last ice age), Egyptian, Pagan, Maya, Essene, Buddhist, pre-Columbian North American, and Easter Islander. Below are some examples – there are many others that have not been included, and may be many more that have not yet been discovered. These sites indicate the existence of a cosmic spirituality, sometimes referred to as an ancient religion of the sun that was practiced by a lost global civilization. An artist’s depiction of the sun setting between the two Great Pyramids and crowning the Sphinx on the summer solstice. At the Great Pyramids of Egypt, when standing looking at the front of the Sphinx, the sun on the summer solstice sets precisely between the two largest of the Great Pyramids. The sun’s descent between the two pyramids seems to enact the moment of creation where the sun emerged from between two mounds, but in reverse, signifying the return of the divine Son/sun to the source of creation. The sun also forms a halo of light around the head of the Sphinx, symbolizing the consciousness crowned by the higher Being. The temple of Osireion at Abydos in Egypt. It shares many architectural similarities with the Valley Temple beside the Sphinx, as well as a connection to the deity Anubis as head of the underworld in alignment with the sun and constellation of Leo (photo CC BY-SA 3.0 by Markh, edited). 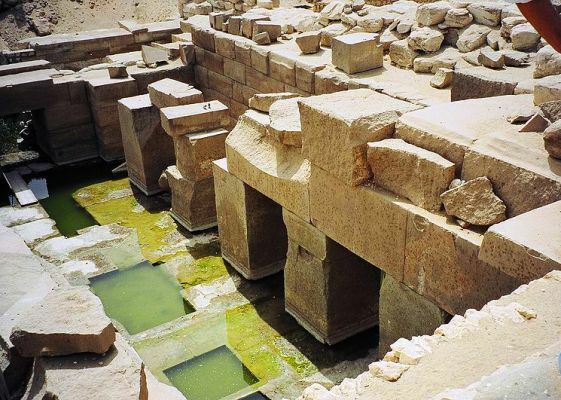 There is an incredibly mysterious temple at the ancient site of Abydos in Egypt. 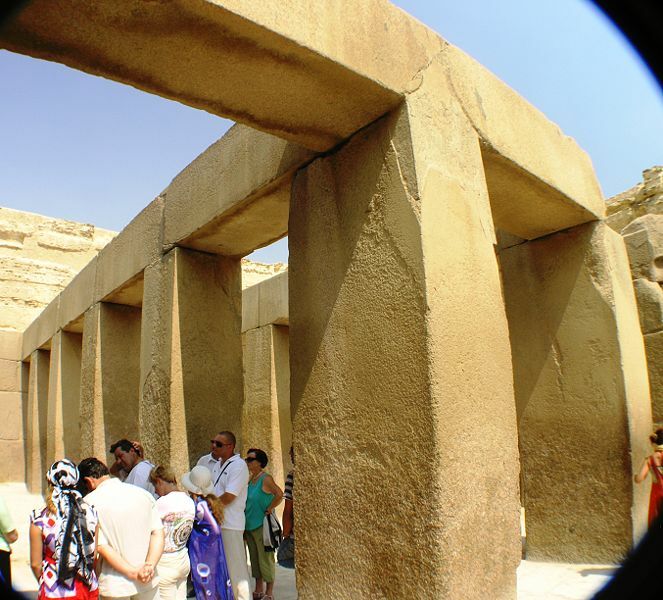 For thousands of years Abydos was believed to be the final resting place of the Egyptian god Osiris. Then in AD 1902 the Osireion temple was unearthed, which many speculated could have been Osiris’ tomb. The Osireion shares incredible similarities with the Valley Temple, which is located next to the Sphinx. Both the Valley Temple and Osireion are made out of huge unadorned granite blocks (which also look very similar to Stonehenge), share the same construction methods, and a number of mathematical characteristics (for example, both feature the number seventeen). The Valley Temple was built at the same time as the Sphinx, and its similarities with the Osireion seem to indicate that the Osireion may too have been built by the builders of the Sphinx. The Osireion is dated to 6,000–3,100 BC, although it is possibly much older. It had been unearthed at least once before when the Pharaoh Seti I uncovered it during the construction of his temple in around 1,280 BC. The Valley Temple located beside the Great Sphinx of Egypt. It shares remarkable similarities in building style with the Osireion, another ancient temple. Both are made out of huge unadorned granite blocks (photo CC BY-SA 4.0 by Daniel Mayer). Like the Great Pyramids and Sphinx, the Osireion has a summer solstice sunset alignment. On the summer solstice, the light of the setting sun shines through a nearby gap in the Libyan Hills, which intersects the Osireion temple. The temple was constructed near a natural spring, which was used to feed a pool of water inside the temple that forms a moat around its central part. Some believe this was intended to symbolize the mound that rose from the primeval waters at the beginning of creation in ancient Egyptian texts, while others draw similarities to the sacred pagan healing well springs of the ancient Britons. Other mysterious aspects of the site include a flower of life symbol found inscribed on some of the pillars of the temple, believed to have been left there by Greeks possibly around 300 BC. 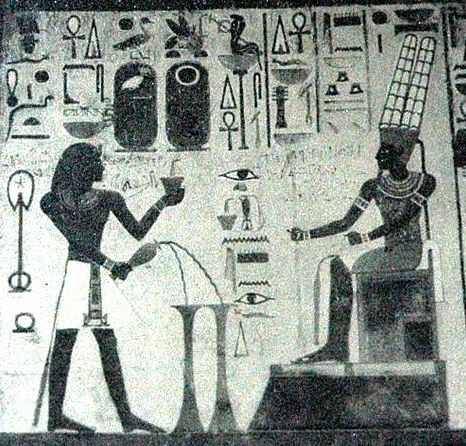 Ancient hieroglyphs of what appear to be hovercraft, and various flying machines like helicopters, can be found in the temple of Seti I next door. The summer solstice sunrise aligns with the avenue off the circle around Stonehenge. At sunrise the sun shines down the avenue, between the two heel stones, into the center of the stone circle. The giant megalithic stone circle of Stonehenge aligns most prominently to the summer solstice—with alignments at sunrise, midday, and sunset. At sunrise on the summer solstice, the sun rose between two Heel Stones outside Stonehenge, and penetrated into its center to the altar stone. A giant ancient avenue leading from Stonehenge to the nearby River Avon also aligns to the summer solstice sunrise. The ancient stone circle called Bluehenge lies where this avenue and the river meet. At midday on the summer solstice, the sun shines directly overhead Stonehenge into its center. Next to Stonehenge there is a large area called the Stonehenge Cursus which is an area of earthen ditches and banks around three kilometers long and 100-150 meters wide. Within this area are two huge pits around sixteen feet across and three feet deep that, when viewed from the Heel Stone just outside Stonehenge, align to the summer solstice sunrise and sunset. Yet another ancient site called Durrington Walls lies two miles northeast of Stonehenge. 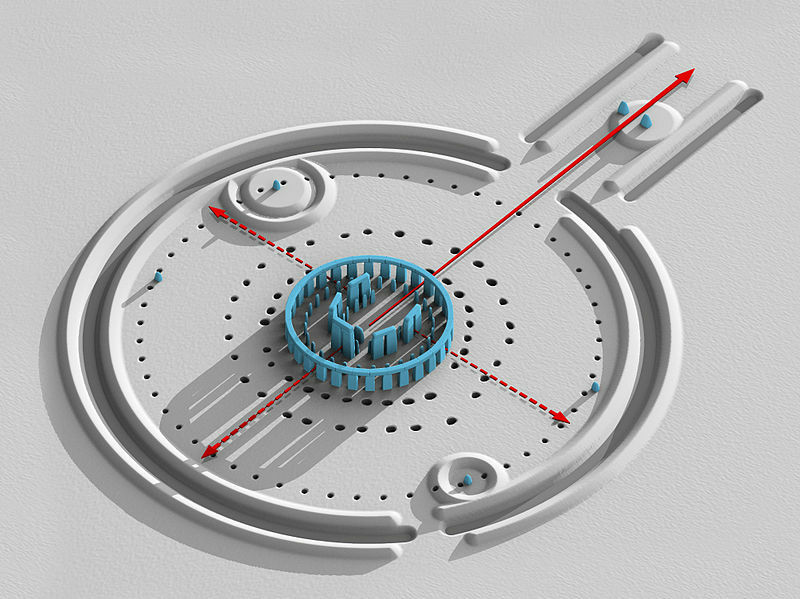 It contains a henge called the Southern Circle consisting of six concentric circles that would have been made out of large timber posts. The circle is aligned to the winter solstice sunrise, but has a paved avenue leading to the River Avon and a post which acted as the Heel Stone aligned to the summer solstice sunset. It is possible that Stonehenge was part of a sacred landscape in which a number of sites were used ceremoniously during various celestial occasions, but it appears they were used particularly at the summer solstice. A replica of the stone circle at Nabta Playa from the Aswan Nubia museum (photo CC BY-SA 3.0 by Raymbetz). 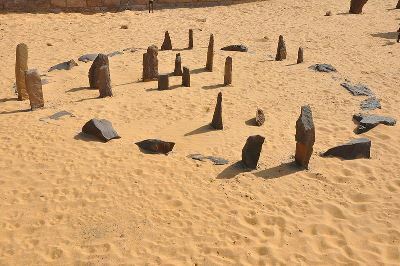 Nabta Playa is the name of a location in the Egyptian desert where there is an ancient stone circle dated to around 4,800 BC (although its alignments would indicate it is far older) that acts as an astronomical calendar, much like Stonehenge. A number of other large stone megaliths are located around the circle and also align to the stars. Together it is claimed they have some astonishing stellar, solar, and even galactic alignments, including to the summer solstice—marking not only the positions of the stars but even the distance of these stars from Earth! The stones align to the rising sun on the summer solstice, as well as the star Sirius (the brightest star in the night sky), Dubhe (the brightest star in Ursa Major), and stars in the belt of the constellation Orion. Interestingly, the summer solstice, Sirius, and Orion were also used in the design of the Great Pyramids and Sphinx—these and other similarities have led many to theorize that the builders of the site at Nabta Playa and the site of the Great Pyramids at Giza (around eight hundred kilometers away) are connected. Additionally, the site was built in the Tropic of Cancer, which many believe was done on purpose so that the vertical stones at the site marked the sun’s zenith passage at the summer solstice (which occurs three weeks before and after it) so that they cast no shadow at all during this time. The astrophysicist Thomas G. Brophy discovered that the stones marked the helical rising (which is the conjunction of a star or constellation with the sun as it rises or sets) of a number of stars in the constellation of Orion on the spring equinox, the star Vega on the autumn equinox (Vega was the pole star around 12,000 BC), and the rising of the galactic center on the spring equinox at around 17,700 BC. An alignment of the pole star on the autumn equinox is incorporated into the design of the descending passage of the Great Pyramid, which you can read about in the chapter on the ancient sites aligned to the autumn equinox—and so it is interesting to see that this combination of alignments was also part of this site. Most incredibly of all however, Brophy discovered that the distance between the megaliths that marked these helical risings matched the distance of the stars they marked from Earth on a scale of roughly 1 meter to 0.8 light years—within the margin of error found in calculating astronomical distances today. On Mount Seskin, the tallest of the Tallaght Hills (outside of the town of Tallaght) there are a number of ancient stone ruins including standing stones and passage cairns. The summer solstice sun rises in the distance, right beside the Lambay Volcano and reflects off a pool of water on the hill called Lin Oir, meaning golden pond. The temple atop of Externsteine near Horn-Bad Meinberg, Germany. The hole in the shrine aligns to the summer solstice sunrise (photo CC BY-SA 3.0 by R. Engelhardt). The Externsteine rocks are a chain of naturally occurring sandstone spires dating from about seventy million years ago. They were a sacred place of pilgrimage in prehistoric, Celtic, and early Saxon times and a site of pagan ritual until the eighth century AD, when Charles the Great cut down the sacred Irmensul tree, the German tree of life. At the top of the tallest spire is a mysterious prehistoric temple; no one knows for certain who built it. 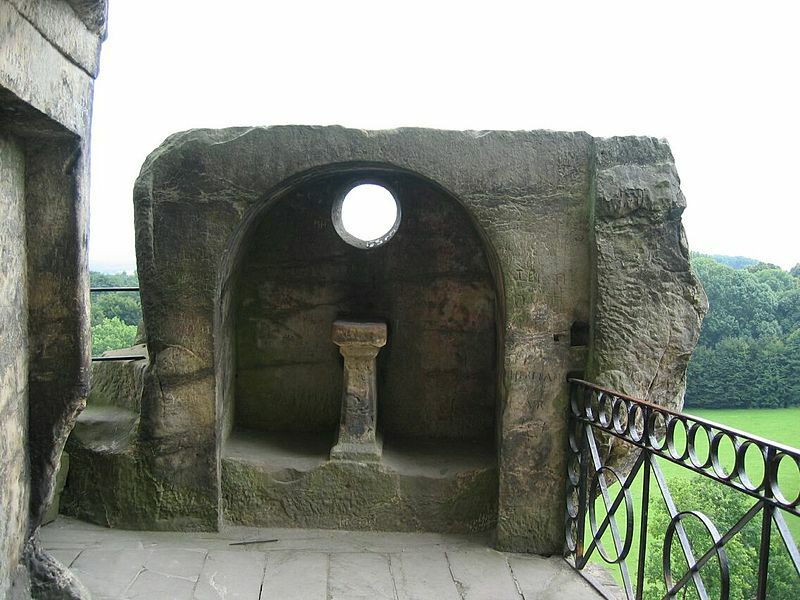 It is centered around a round hole above an altar carved into a small stone shrine. This hole looks out at the surrounding landscape and aligns to the moon at its northern extreme and the sun at sunrise on the summer solstice. The cave at Ajanta called number 26, which aligns to the summer solstice sunrise. As the sun rises, a beam of light penetrates this cave and illuminates the stupa and the statue of Buddha within (photo CC BY-SA 3.0 by dola.das85). 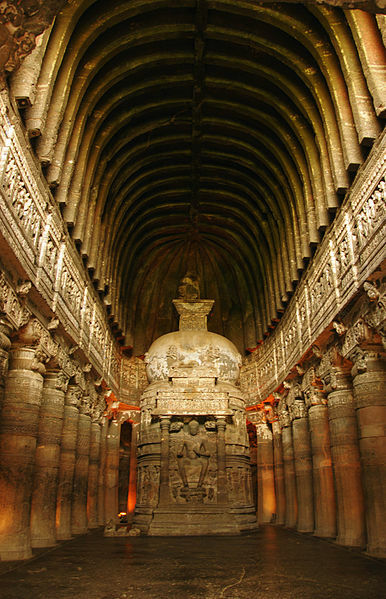 The Ajanta Caves are an extraordinary group of around thirty man-made caves cut into the side of a sheer cliff face. The cliff is naturally U-shaped and was hidden in a remote part of the jungle. The caves are believed to have been built by Buddhist monks by carving into the cliff face—what they created were elaborate shrines and temples, all cut into one single giant rock. Work is believed to have begun on the caves in around 200 BC and ended around AD 480–650. The caves contain sculptures and artwork centered around the life of Buddha. Two of the caves align to celestial events. Cave twenty-six aligns to the summer solstice sunrise. It contains a statue of Buddha seated within a stupa, which is illuminated by the rays of the rising sun on the summer solstice. The creator god Amun being worshiped, seated with his feet raised above the level of the ground similar to the statue of Buddha at Ajanta. A stupa is a symbolic monument which is said Buddha uses to ascend and descend. The summer solstice is a time of ascent. In the cave aligned to the summer solstice Buddha is seated with his feet on a pedestal. Perhaps this was symbolic of him no longer being on the earth—similarly, ancient Egyptian gods were sometimes portrayed upon pedestals to show their heavenly status. This is about 1/3 of the chapter on the sacred sites aligned to the summer solstice. Keep reading in the book The Path of the Spiritual Sun.